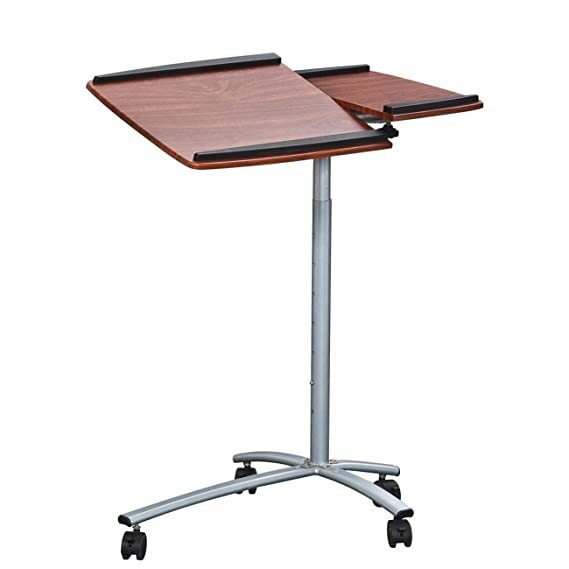 The Techni Mobili Rolling Laptop Stand is made of heavy-duty engineered wood panels with a moisture resistant PVC laminate veneer and a scratch-resistant powder-coated steel frame. The dual pivoting table panels each feature safety edge-stoppers to prevent objects from sliding off when the panels are tilted. You can easily adjust the height between 31 and 45.5-Inch with a 7-pin spring system. The extended 4th leg provides increased stability along with large double-wheel non-marking casters with locking mechanisms. Each table panel has a 15 lb weight capacity. COLOR: Mahogany. This stylish Techni Mobili Glass-top Desk is constructed with a heavy-duty 8 mm tempered safety glass desktop and a silver scratch-resistant powder-coated steel frame. The built-in file cabinet, made of heavy-duty engineered wood panels in chocolate color with a moisture resistant PVC laminate veneer, features a small shelf beneath the desktop, two storage drawers, and one letter size hanging-file drawer. The top drawer lock protects the entire cabinet and a non-marking nylon caster provides additional support when the drawers are open. Color: Chocolate. 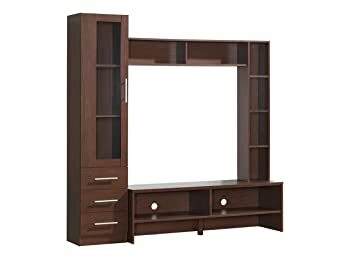 This contemporary Techni Mobili Entertainment Center, for LED/LCD flat screens up to 55″, is designed as a centerpiece for any family, living, or bedroom. It includes two open shelves with wire management holes, perfect for hooking up your DVD or Blue Ray player, video game console and more! Three drawers provide optimal storage and six additional shelves and the side shelves with glass doors are great for displaying mementos. The Techni Mobili TV Stand is made of heavy duty compressed wood with a scratch resistant PU paper laminate finish. The tempered glass doors are tougher than untreated glass. Important: Holds TV’s up to 55″ when TV is measured diagonally. Actual Unit TV opening is 47″ . Overhang is Not suitable. We recommend you leave a minimum of 1″ to 2″ space between the TV and the unit on all 4 sides. Weight Capacity lbs. 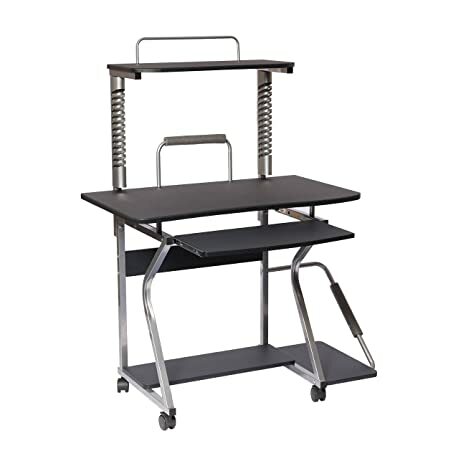 The Techni Mobili Deluxe Rolling Laptop Cart with Storage is made of heavy-duty engineered wood panels with a moisture resistant PVC laminate veneer and a scratch-resistant powder-coated steel frame. The table panel tilts so you can adjust it to the most ergonomic, comfortable working angle. It also features a safety edge-stopper to prevent objects from sliding off when tilted. You can easily adjust the table height between 30.75 and 45.5-Inch with dual adjustment knobs. There is an open storage compartment and a closed storage compartment with bottom hinges. Two of the fours non-marking nylon casters include locking mechanisms. The table and closed storage top and bottom shelves each have a 20 lb weight capacity and the base of the cart has a 30 lb weight capacity. COLOR: Black. 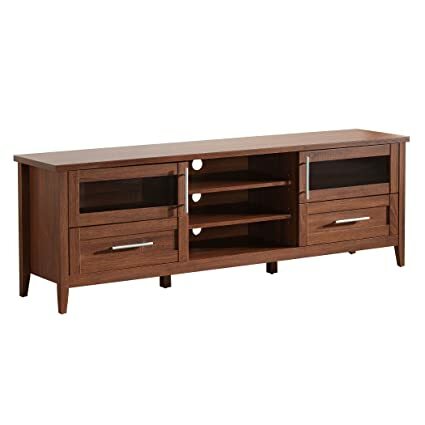 This contemporary Techni Mobili TV Stand, for TVs up to 70″, is designed to fit any family, living, or bedroom. It includes three open shelves with wire management holes, perfect for hooking up your DVD or Blue Ray player, video game console and more! 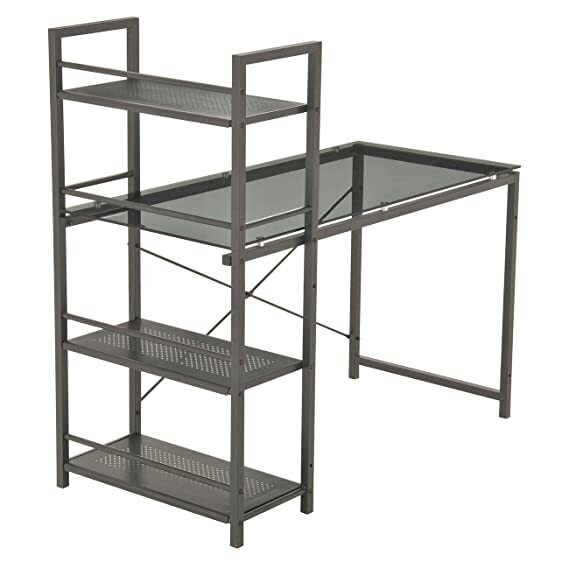 Two pull out drawers provide optimal storage and two shelves with glass doors are great for displaying mementos. The Techni Mobili TV Stand is made of heavy duty compressed wood with a scratch resistant PU paper laminate finish. Important: Holds TV’s up to 70″ when TV is measure diagonally. Actual unit is 72″ wide but TV overhang on either side is suitable. Weight Capacity 130lbs. 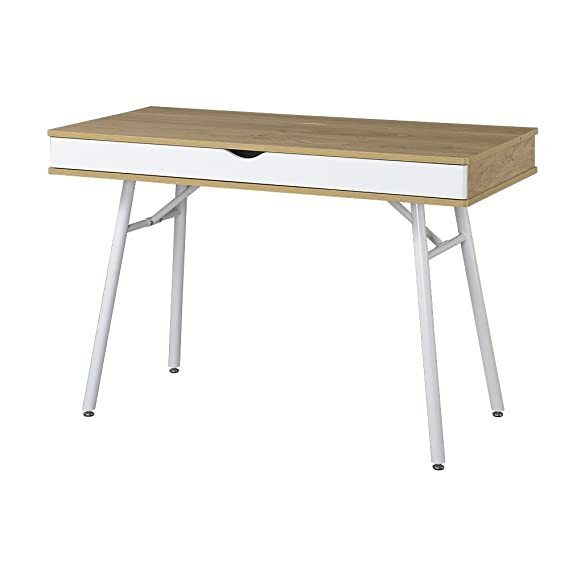 This Techni Mobili Computer Desk with Storage boasts a simple yet elegant design. It features a spacious elevated desktop above a pedestal with three utility drawers, along with a large slide-out keyboard panel equipped with a safety stop. This modern, sleek design compliments just about any room even within the tightest areas without compromising your storage needs. Its MDF panels are made of heavy-duty engineered wood with a moisture resistant PVC laminate veneer and a scratch-resistant powder-coated steel frame. The desktop has an 80 lb weight capacity, the slide-out keyboard shelf hold up to 30lbs, and the three storage drawers each have a 22lbs weight capacity. Color: Mahogany. Upright MDF Computer Desk with Media storage and CPU shelf. 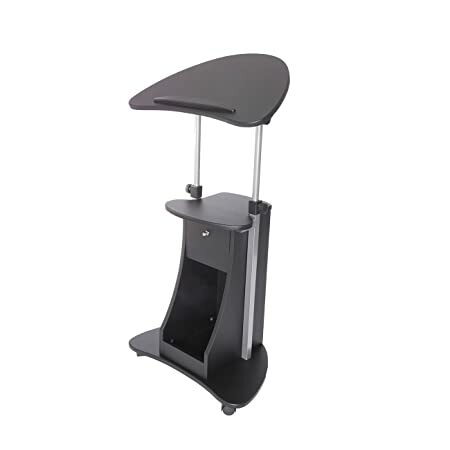 Upright frame and legs made of powder coated steel frame to store any media and CDs. All panels made of MDF covered with PVC laminate surface. 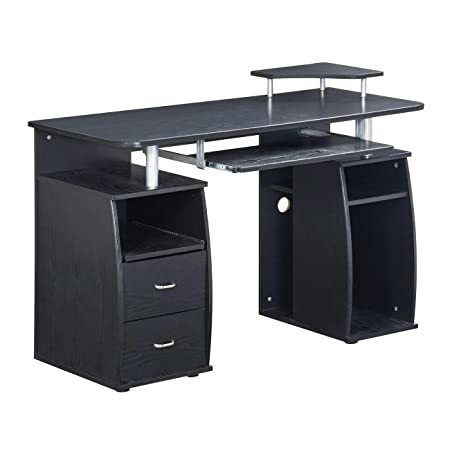 It includes a large pullout keyboard with safety stop, top printer shelf, dual wheel casters for easy mobility, bottom accessory shelf and a side CPU shelf with tube protection. Ready and easy to assemble. 5 Year Mfg. Warranty. The Techni Mobili Rolling Laptop Desk with Storage works with you to get it all done. 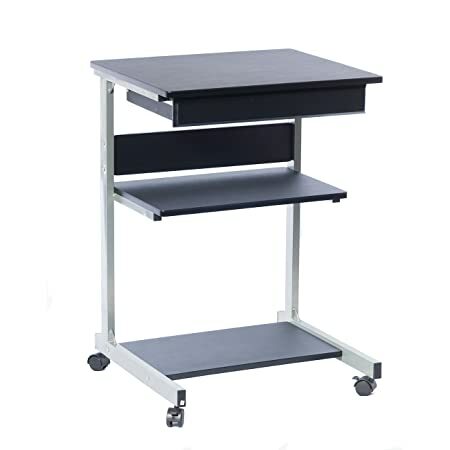 Rolling on casters for easy storage in the dorm or home, this desk features a single drawer and two shelves for storage. It is made of heavy-duty engineered wood panels with a moisture resistant PVC laminate veneer and a scratch-resistant powder-coated steel frame. Two of the fours non-marking nylon casters include locking mechanisms. 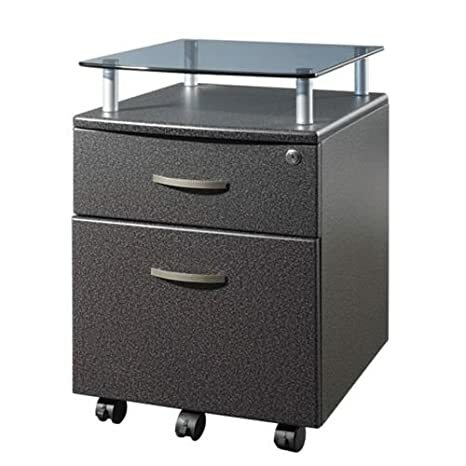 The desktop has a 90 lb weight capacity, the drawer can hold up to 10 lbs, the top shelf has a 50 lb weight capacity and the bottom shelf can hold up to 70 lbs. COLOR: Graphite. This modern Techni Mobili Deluxe Tempered Frosted Glass L Shaped Corner Desk features a spacious desktop that can be configured to your preference, with the long and short sides being interchangeable. 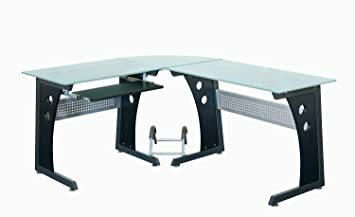 It is made of frosted heavy-duty 8 mm tempered safety glass atop a scratch-resistant powder-coated steel frame with heavy-duty MDF panels with a moisture resistant PVC laminate veneer. The slide-out keyboard shelf, also made of engineered wood, is equipped with a safety stop. Each glass desktop panel has an 80 lb weight capacity and the keyboard shelf has a 30 lb weight capacity.It is ready and easy to assemble . Contemporary Computer Desk. Constructed out of MDF panels with a PVC laminate surface and powder coated steel legs. 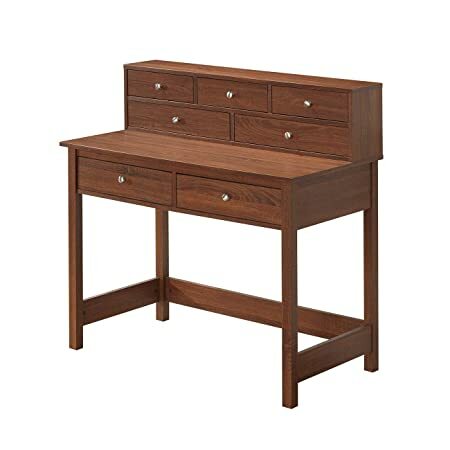 Unique modern design includes two side storage drawers and a pullout drawer that can be used for a keyboard or for additional storage for your laptop, tablets or any media accessories . 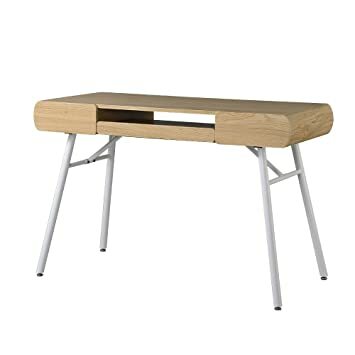 This desk comes “pre-assembled” for quick assembly and only the metal legs need to be installed. Designer Computer Workstation with Storage. Constructed out of particle board with paper laminate surface and powder coated steel legs. 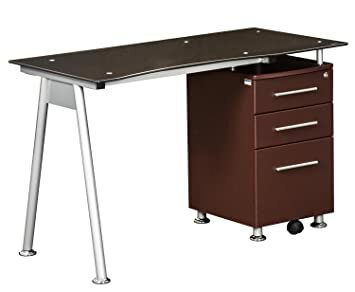 This desk features a full width multi-compartment storage drawer to store all of your accessories and it even has enough space for a laptop or tablet. It also includes a back storage compartment for cord management with an easy up and down cover. Easy and ready to assemble.